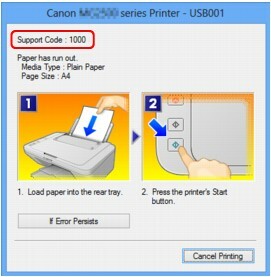 When an error occurs in printing such as the machine is out of paper or paper is jammed, a troubleshooting message is displayed automatically. Take the appropriate action described in the message. 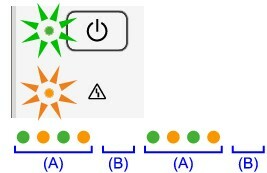 When an error occurs, the Alarm lamp flashes orange and a Support Code (error number) is displayed on the computer screen. For some errors, the ON lamp and the Alarm lamp flashes alternately. Check the status of the lamps and the message, then take the appropriate action to resolve the error. There is no paper in the rear tray. The cover is opened while printing is in progress. Paper is jammed in the paper output slot. The FINE cartridge is not installed properly. The FINE cartridge is not installed. The FINE cartridge cannot be recognized. Appropriate FINE cartridge is not installed. The ink absorber is almost full. The protective material for the FINE cartridge holder or the tape may remain attached to the holder. Paper type and paper size settings are incorrect. You cannot print the contents on CREATIVE PARK PREMIUM. The ink may have run out. The ink has run out. An error requiring you to contact the service center has occurred. You can confirm the actions against errors with Support Codes on your computer by searching a Support Code. This entry was posted in การแก้ปัญหาเบื้องต้น, การใช้งาน and tagged Canon E400 ปริ้นไม่ได้. Bookmark the permalink.